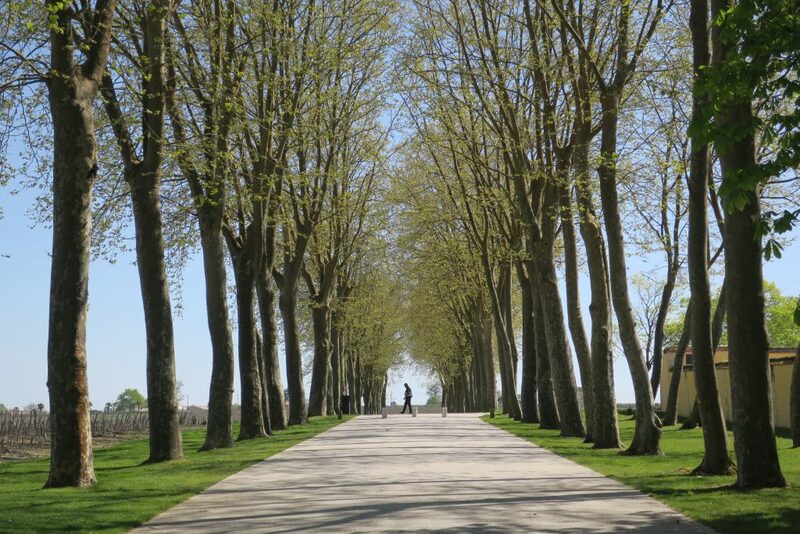 Home » Regions » France - Bordeaux	» Château Margaux: Is It Worth It? 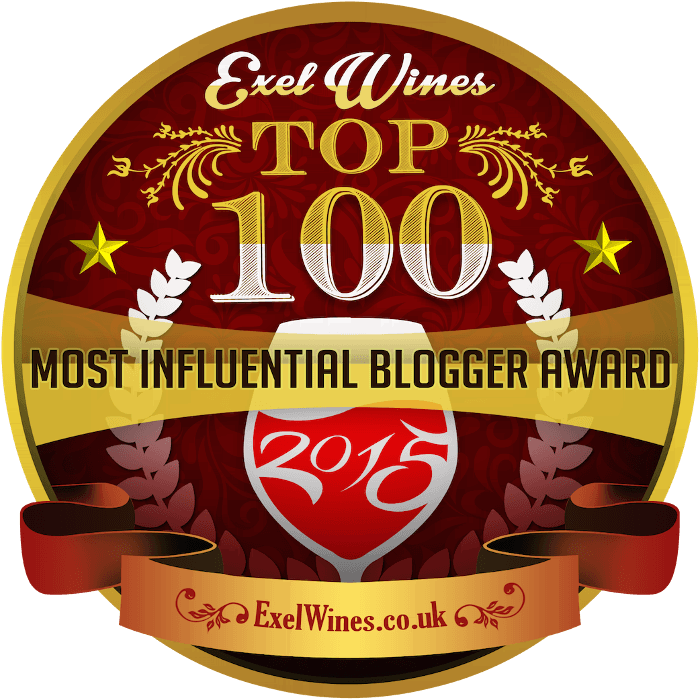 Château Margaux: Is It Worth It? “I don’t know! 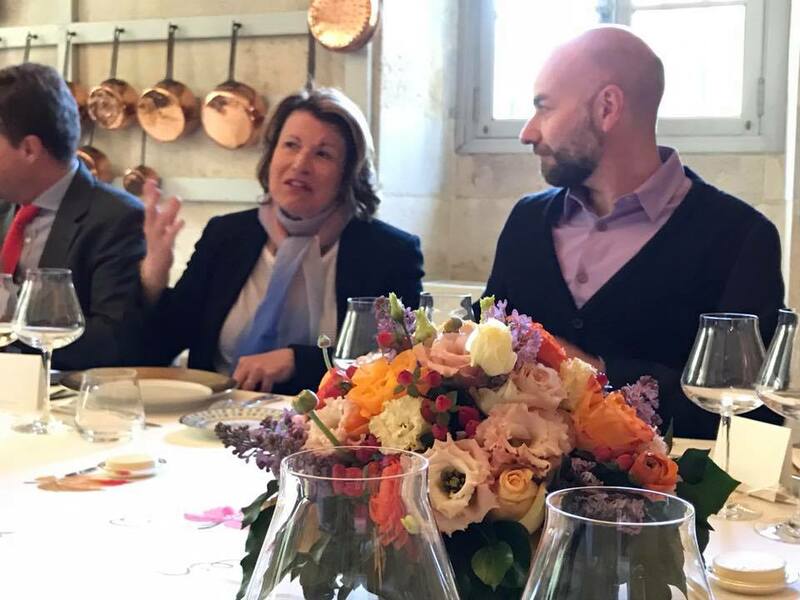 Do I like Rob?” asked Corinne Mentzelopoulos, owner of Château Margaux, while considering the seating arrangement for lunch. We all laughed, because she was almost certainly joking. Against her better judgment, she placed me next to her at the dining table. Immediately I was smitten by this woman, with her easy elegance and wicked sense of humor. 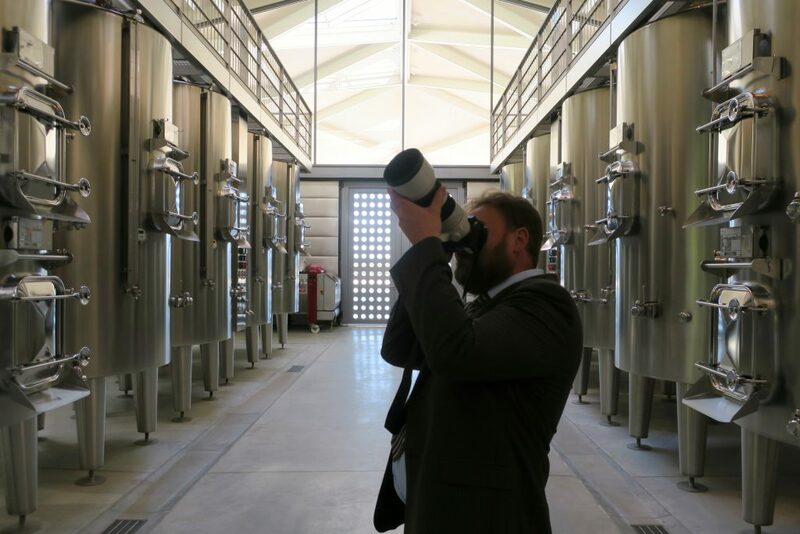 I had anticipated a lunch in the airy new Norman Foster-designed winery with Valance and perhaps a PR person for Margaux. But our group paused before the tall gates leading to the neo-Palladian château itself, and they proceeded to swing open. The building looked familiar — it appears on the château’s wine labels, which I had seen reproduced in my World Atlas of Wine. But the drawing didn’t prepare me for the experience of standing in front of the château itself. It has a startling and imposing verticality, with four ionic columns and a pediment rising from a base that itself is 22 steps above ground level (I counted). Château Margaux’s General Director Philippe Bascaules descended to meet us, accompanied by what appeared to be a foxhound. I have been witness to few tableaux more aristocratic than this. He led us inside to the entry hall and an adjacent salon, both decorated in high French Empire style, with spindly-legged chairs upholstered in jewel-tone silk damask and marble-topped tables supported by winged caryatid figures. In my hand was a flute of Krug Champagne. I stared at it and my surroundings for a moment, feeling a sort of elated confusion. Instead, I fell into conversation with Monsieur Bascaules. He had loved his time at Inglenook, he told me, but he was pleased to be back in France, at Margaux, where he had worked for 20 years before his time in California. I asked what food he most craved when he returned to France. “The bread,” he replied, without hesitation. “A crusty baguette… it’s just different here.” I told him I agreed, and that I felt the same way about chocolate chip cookies. It’s impossible to find good ones outside the U.S, I explained. Just as I realized that I was using my time with Philippe Bascaules to discuss baked goods, we were summoned to lunch. We descended to the former kitchen. The formal dining room is too stuffy, Mentzelopoulos told us, and doesn’t promote relaxed conversation. A fire blazed in the giant hearth, complete with a spit for roasting entire lambs or pigs. In the center of the vaulted room of golden stone was a round table, laid with crystal wine glasses, tightly packed flower arrangements and delicate china of green, gold and white, all atop a pristine tablecloth embroidered with silk leaves. This room may be the more casual, relaxed dining space, but it dazzled nevertheless. I took my place at the table between Madame Mentzelopoulos and her son, Alexis Leven-Mentzelopoulos (he goes by Alexi). His sister, Alexandra Petit-Mentzelopoulos sat across from us. Because the two of them were young, beautiful, thin and rich, I hoped just a little bit that they would be haughty or in some other way unpleasant. Instead, they proved to be quite down-to-earth and charming, and as fluent in English as in French (and goodness knows what other languages). Alexandra later asked me for my card. “I want to know the best place in Chicago for deep-dish pizza,” she told me, to my astonishment. I looked at the hand-lettered menu (which did not mention pizza, for better or worse) and discovered that we would be starting with the 2011 Pavillon Blanc du Château Margaux, a 100% Sauvignon Blanc classed as a humble Bordeaux AOC (the Margaux appellation has no room for whites). 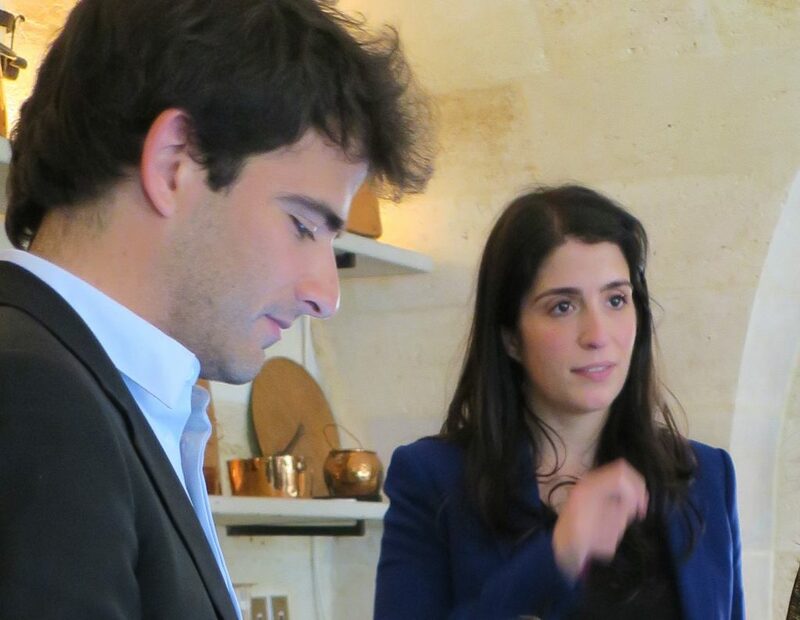 Château Margaux has produced a white for three centuries, Madame Mentzelopoulos explained to us, starting when the château’s winemaker decided to separate the white and red grapes during vinification. Until then, most Bordeaux wines had been field blends of both red and white grapes. It smelled spicy, with an undertone of tropical fruit. The wine felt lush and round, with creamy stone-fruit and tropical-fruit flavors, leavened with some focused green-peppercorn spice. A forceful but graceful wine, with a finish that was long and fresh. It worked beautifully with some crab salad topped with mango gelée. If you tasted this side by side with a Sauvignon Blanc from, say, New Zealand, you would never guess that the wines came from the same grape. Binny’s currently sells the 2015 Pavillon Blanc as a future for $140 a bottle. It’s steep, but if you have the funds, the wine is worth the money for a special occasion. 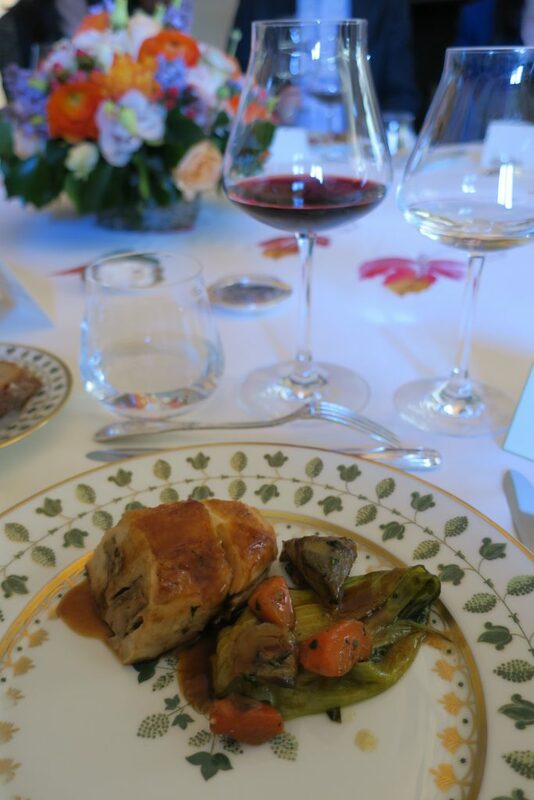 To pair with some foie gras-stuffed chicken, waiters poured us glasses of 1996 Château Margaux. 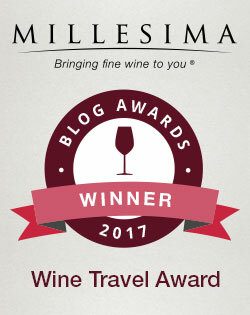 Of this vintage, wine writer Jancis Robinson wrote, “You might call the 1996s classic, so long as you were sure that this would not be interpreted as skinny.” All the other sources I consulted also regarded 1996 as a very fine vintage for Cabernet Sauvignon in the Médoc, the left bank region where Margaux is located. 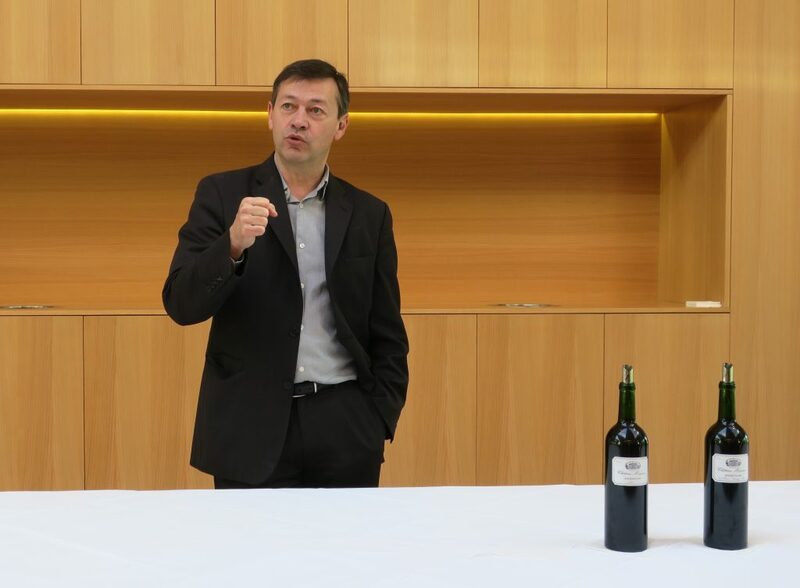 Aurélian Valance held up his glass and said simply, “This is Château Margaux.” He went on to tell us how this particular bottling was the first to give him a “wine emotion.” He loved it so much, in fact, that it inspired him to approach Madame Mentzelopoulos and ask if he could work at Château Margaux. She appreciated his enthusiasm and chutzpah, and gave him a job. Madame Mentzelopoulos told us that “The tannins of Château Margaux are always very soft — you almost forget them.” That’s no mean feat for a wine composed of 82% Cabernet Sauvignon aged in 100% new oak (the rest of the blend in this vintage is 12% Merlot, 4% Petit Verdot and 2% Cabernet Franc). “Sometimes people confuse the tannins of wood with the tannins of grapes,” she explained. Wine.com currently sells the 1996 for $850 a bottle. What on earth do you get for that price? I smelled the wine, redolent of dark cherries but with a wonderful freshness buoying them up. I braced myself — it’s not every day I try an $850 wine — and took a sip. The fruit flavors of dark berries and cherries felt pure and rich, and the wine positively vibrated in my mouth. The fruit rang like a bell, such was its clarity. The wine hummed on my palate, developing with great evenness and confidence. It moved with consistency, grace and firmness from one note to the next, and it still felt young, in spite of its age and in spite of it having been decanted. I wish I could say that I responded with something like, “Madame, I am shameless!” or “Au contraire, Madame, it is you who should be ashamed!” But my mind was still aglow with the wonder of the wine, and witticisms were temporarily beyond my capacity. It’s hard to believe that a wine that costs $850 a bottle could possibly be worth it. After all, there are perfectly lovely wines that cost $12. If you are one of the fortunate few with $850 to blow on a bottle, are you getting anything for your money other than hype and prestige? 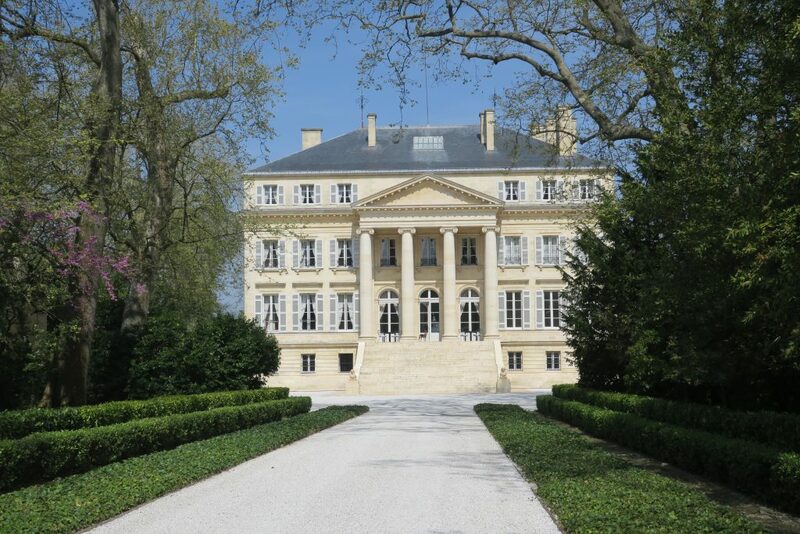 What makes Château Margaux so special that it can charge such a price? It’s the finesse. The wine shifts gears in the mouth like an expert driver handling a finely tuned stick-shift racing car. That kind of experience comes at a price. Château Margaux is wildly expensive, yes, but it has the stuffing to back up the price. You can bet that if I were a millionaire, I wouldn’t hesitate to buy a case. The 2016 vintage looks just as promising, should you be interested in investing in futures. The aroma of the château’s second wine, Pavillon Rouge, leapt from the glass, and I loved its cherry-pie fruit and sneaky tannins. The 2016 Château Margaux already felt lush and integrated, with rich fruit, focused acids and graceful tannins, capped with a fresh note of mint. And the 2016 Pavillon Blanc had all the tropical fruit and creamy stone fruit I loved in the 2011, plus an enticing note of popcorn and juicy green-apple acids. What a joy. On our way to the winery to taste the 2016 vintage, Madame Mentzelopoulos drew our attention to a mosaic mounted on the wall. “This is a Roman mosaic, but it has the Greek name,” she told us. “I like that it’s Dionysus, and not Bacchus,” she continued. A few people, aware of the title of my blog, glanced nervously in my direction. “Dionysus is elegant, you see here,” she said, pointing to the lithe figure in the center. “Bacchus is fat and drunk and vulgar.” And very, very happy, I’d add. Whether Madame Mentzelopoulos liked me or not is an open question, but my feelings about her and her wines are not in doubt. 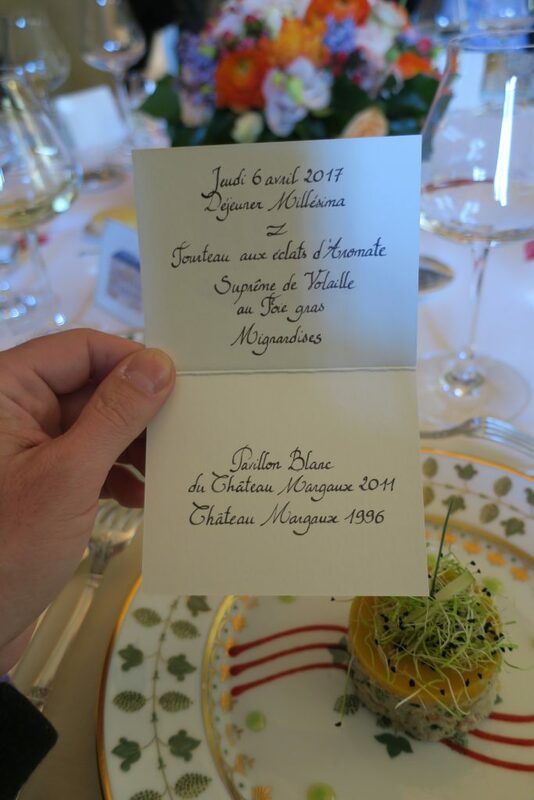 Note: The lunch and wines at Château Margaux were provided free of charge, as part of the program for the Millésima Wine Blog Competition winners. *Nevertheless, I couldn’t help but notice that the Krug somehow managed to feel crisp and rich at the same time, and that its bubbles were sublimely elegant. But for my money, I’ll stick with a lesser-known Grower Champagne. Wonderful blog! Made me feel like I was there – as usual, I want those gorgeous plates! Thank you, Marcie! And yes — those plates were really beautiful. What a table setting that was! When no-one was looking, I turned one upside down and found out they are Limoges! Ha ha! I love that you did that! I was so tempted, but I was sure Madame would catch me. Rob, you perfectly captured that moment in time and with your inimitable good humor. Well done! Thank you, Jeff! I’m so glad you enjoyed the post!